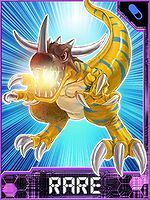 The most oustanding Greymon, even for a Dinosaur Digimon as a Combat Species, further increased in aggressiveness. 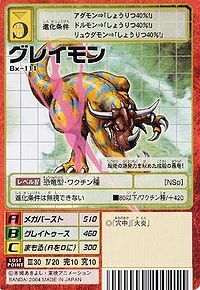 Although it has a relatively small build among Dinosaur-types, many of which are large Digimon, it has fully exhibited its carnivorous dinosaur-like ferocity, winning in battles and increasing its own strength. 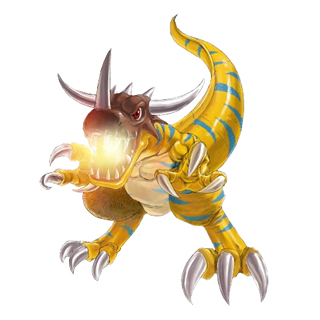 It acquired its "Mega Burst", which has the explosive power of "Mega Flame" enhanced to its limit within its mouth. By fully exhibiting its carnivorous dinosaur-like ferocious nature, it increased its own fighting strength. Special Move: Explosively fires extremely high-temperature flames enhanced to their limit (Mega Burst). | Grey is most likely a misspelling of grea, short for great. It also may come from grey, meaning old or ancient. X because it was modified by the X-Antibody. 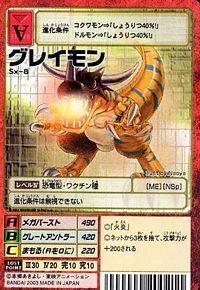 Anime/Manga D-Cyber: "Chapter of Courage"
Uses an ultra high-temperature Mega Flame after enhancing it to its limit in its mouth. Shoots flames from its mouth. 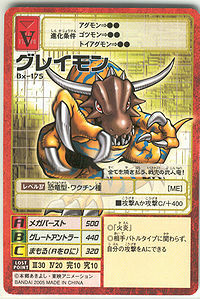 Great Antler  グレートアントラー Gurēto Antorā Great Horn Attack Headbutts the enemy with its powerful horns. Evolves from Agumon X-Antibody or DORUmon. Can evolve to DORUguremon, Metal Greymon X-Antibody, or Okuwamon X-Antibody. Evolves from Agumon X-Antibody, Kokabuterimon, Otamamon, or Piyomon. 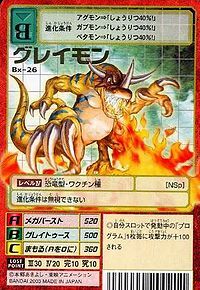 Can evolve to Dagomon, Metal Greymon X-Antibody, or Volcdramon. This violent, tough-shelled dragon hides its great explosive power! This battle-helmeted warrior dragon reduces everything to ashes! ↑ 8.0 8.1 D-Cyber: "Chapter of Courage"
This page was last modified on 27 October 2018, at 19:23.